“Union Table,” a regulation-size, artistic translation of a pingpong table, was designed and created by three Twin Cities artists: Noah Keesecker, Andrew MacGuffie, and Peter Haakon Thompson. ST. PAUL, Minn. (June 5, 2013) – Union Depot in St. Paul will be at the center of the 2013 Northern Spark all-night arts celebration on June 8, focusing attention on the historic structure’s unique role as a regional transportation center that creates a memorable passenger experience with arts, cultural events and programming. Union Depot, built in the 1920s, re-opened to the public in December 2012 after a two-year, $243 million restoration. The architectural magnificence of the building and the project’s embracement of the arts were important in attracting Northern Spark festival planners to consider Union Depot as a key site for this year’s event. Northern Spark is the only all-night arts festival in the Midwest—a free, dusk-to-dawn participatory public art event modeled on a nuit blanche, or “white night” festival. This year activities – which include performances, visual arts, projected images, interactive media, and participatory events – will be focused in and around the newly renovated Union Depot. 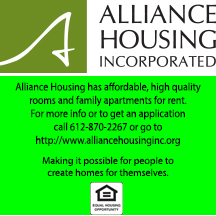 Other key Lowertown sites include the Bedlam Lowertown Theatre, Minnesota Museum of American Art, Black Dog Coffee and Wine Bar and the ever-present Mississippi River. For more information visit NorthernSpark.org. As part of the federally-funded renovation project, Union Depot, owned by the Ramsey County Regional Railroad Authority, issued $1.25 million in public art grants. 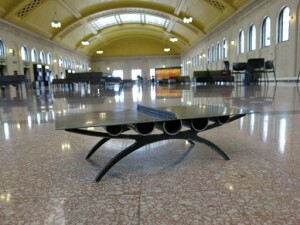 The first of 10 public art installations, “Union Table,” an interactive musical pingpong table, will be available in the waiting room of Union Depot just in time for the Northern Spark celebration. The artist team embraced the concept of Union Depot as the “Living Room of St. Paul” by combining sculpture and community game play. “Union Table” is a sculptural steel, musical, participatory pingpong table that will engage people as a source of entertainment, a tool for creating conversations and an interactive musical instrument for exploration and expression. Following the festival, the game table will be a permanent fixture of Union Depot’s waiting room, available to those who want to enjoy a quick game over lunch, a spirited tournament amongst friends, or to make a connection with a stranger through the simple act of play. “Union Table” will be just one of many features that will invite visitors to enjoy the public space. The remaining nine public art projects will be installed at Union Depot throughout the summer and into the fall. Kudos to Andre Smith who has been with the project from the beginning to to end .He has and always will take pride in maintaining a clean and safe building for the enjoyment of the public .